As news of World War I and Spanish flu filled the local papers, the first headlines related to Billerica’s car shop murder almost could have gone unnoticed. In fact, the murder itself went unnoticed for several days. The last anyone had seen of Fred Soulia, an employee at Billerica’s Boston & Maine car shops (today’s Iron Horse Park), was when he began walking home from work on a Thursday evening in early November. Somewhere during the two-mile walk to his home on Oak Street, Soulia disappeared. His coworkers noticed his absence on Friday morning, grew concerned, and went to his home that afternoon. No one answered the door. Then, Fred Soulia didn’t come to work on Monday either. His two friends walked to his home again and knocked. Again, no one answered. Soulia lived alone and had no family in Billerica; maybe he had gone home. One of the men noticed blood on his walkway. The men followed the blood stains out to Oak Street. A half-mile away, the trail ended in a mound of loosened earth. The men called the authorities. Officers O’Brien and Livingston responded and investigated the loosened earth. They soon found Soulia’s lunch pail. Then, they found his spectacles and hat. When they discovered the blood stains on his hat, they scoured the area. They found another patch of loosened earth, further from the path. 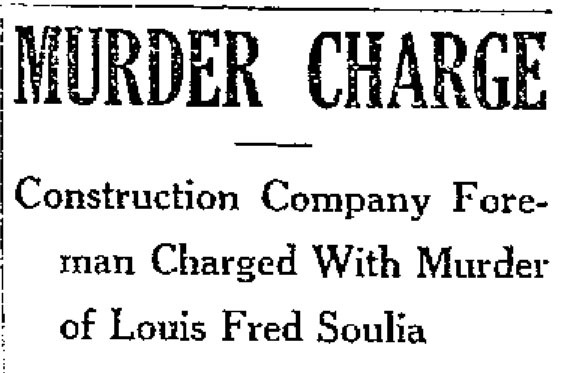 The officers didn’t have to dig far before they found Fred Soulia’s body, still clad in his work clothes, so bloodied that they couldn’t determine just what had killed him. The killing marked the town’s first in almost 25 years. The officers summoned Lowell’s medical examiner Dr. Smith, who soon found another spot, a quarter-mile away, where the ground had been trampled. He found more blood there – and a path of blood, showing where Soulia’s body had been dragged past his house, and to its shallow grave. Dr. Smith surmised that the body had been buried first, the hat, pail, and spectacles later, when they were found – to hide any evidence of the crime. An autopsy later revealed that Soulia had been shot three times and stabbed fifteen. Finding a motive for the murder stumped Lowell and Billerica authorities. Soulia, 50, lived alone, in a quiet little house he had built himself on Oak Street, in what was then a sparsely populated area of Billerica. Of French descent, he had lived in Billerica only a few years – working a while for the Tewksbury constable, and then the most recent two or three years at the car shops in its scrap reclamation department. Everyone liked him, though no one knew if he had any relatives in the area. He was a faithful attendant of St. Andrew’s Church. Theories soon emerged around potential motives for the killing. Soulia was found with one of his pockets turned out, and without money. Perhaps he was killed for his cash. Or, some news was emerging from the car shops that a large theft of brass had occurred from his scrap reclamation department. Maybe he knew something about that. Days before he died, Soulia had been walking to work, on a forest path between Oak Street and the car shops, when he came across a culvert and some men who were contractors at the car shops. Soulia struggled to see past them into the culvert. The men tried to obstruct his view, but he saw enough to spot some of the brass that had gone missing at work. He left, but later brought the foreman of his department to retrieve the stolen brass – over a ton of stolen brass, in fact. The car shops retrieved the brass and didn’t involve the police – until Solia turned up dead a week later. Investigators soon found three sets of footprints leading away from the murder scene, to a road nearby. Billerica Police began looking at the men Soulia had turned in for the brass theft, contractors from a Reading construction company. Billerica police visited the home of Joseph Cordio, who lived on Oak Street near Soulia. A search recovered a long knife and a revolver. When police found his shovel coated with the same type of sand found in Soulia’s shallow grave, Cordio grew nervous and his story fell apart. Investigators next identified the other two men, Lawrence brothers Francisco and Luigi Feci. At Francisco Feci’s home, they found a shoe matching the footprints found at the murder scene. A gun found in his coat had recently fired three shots. And a Zira cigarette box found in the woods near the body matched the many cigarette boxes found in Feci’s home. Police arrested Francisco Feci; his brother Luigi fled before he could be captured. The trial lasted six weeks, ending on May 18, 1920, when Francisco Feci was found guilty. His brother Luigi, having fled, was not tried. Due to a lack of evidence, Joseph Cordio was found not guilty. Francisco Feci was sentenced to death, and, despite a somewhat credible last-minute appeal to Governor Coolidge, died by electrocution on August 16, 1920. He went to the chair smiling, professing his innocence, and insisting that it was his brother Luigi who had killed Soulia, not him. Hi Ryan, interesting story, and one I’ve never heard before. We tend to think of crime as a modern thing, but there was a great deal of crime back in the day.